The novel Seasons of Flights by Manjushree Thapa is a good read. The novel by this acclaimed Nepali author has described about the life of an immigrant Nepali citizen who has moved to US from Nepal following her selection through a DV lottery. The book revolves around the life of the girl, a grown woman to be more precise and her emotional and psychological state. It describes how the life, the thinking and behavior of her changes along with the change in time and place. The book describes the story of Prema, a girl from a small war-torn village of Nepal who has lost her mother at young age due to her mother’s constant unsuccessful attempts of giving birth to a son. This incident has affected her deeply making her feel differently towards love, relationships and childbirth, thinking of them as risk taken. It was because she had thought that her mother had loved her father too much to quit the attempts and it was that love of her mother which gradually took her life. A good student at school, Prema was always loved by and cared for by her father. Her younger sister Bijaya, later joins the rebels, the Maoists and goes to live in the forest with the battalion. Prema gradually moves to a town for her work in an NGO where she meets Rajan, the man she has grown to love. Her life revolves around these characters until she gets a call for her acceptance of a DV for which she had filled up a form just because the kid in the local café asked her to. While she is deciding between staying and leaving, many changes occur around her, one being the disappearance of Kancha who had been arrested by the army. She finally decides to leave, leaving behind all the memories of the country and even when in America, she keeps her distance with the Nepalese or anyone related to Nepal. She finds herself among the Americans in the company of her new love Luis. However, she finds herself different than these people and her soul searching begins yet again until she is introduced to an endangered species of butterfly that gives her a sense of belonging. Her journey from small village in Nepal to the big town in USA, from being a Nepali to being an American, her phase of transformation and how she tackles and deals with it is mentioned in the book along with the accounts of events that happened in Nepal during and after the civil war is mentioned through the various characters. 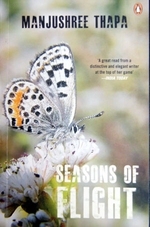 The book Seasons of Flight by Manjushree Thapa, published in 2010 is, therefore, a good read.